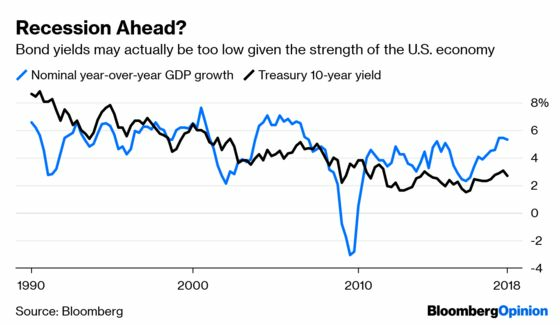 (Bloomberg Opinion) -- Now that significant portions of the bond market’s yield curve has inverted, including the part that the Federal Reserve thinks is significant, the race is on to decipher the message being sent. The knee-jerk conclusion is that a recession lies ahead. 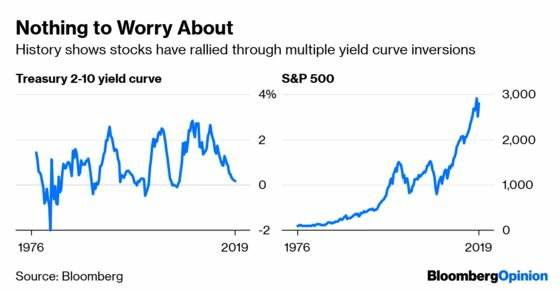 After all, every recession since the 1950s has been preceded by an inverted yield curve. On the other hand, not all inverted yields curves have led to a recession. Inversions – which occur when short-term bond yields rise above those on longer-term bonds – don’t cause a recession in and of themselves; rather, they are a signal that bond investors expect a significant slowdown in the economy. And they’re usually right: recessions have typically followed anywhere from six to 24 months later. But what about now? If you think about it, expectations for a recession in the months ahead aren’t new and predate this latest inversion. Back in February, the National Association for Business Economics’ semiannual survey of business economists found that 10 percent saw a recession beginning this year; 42 percent projected one next year; and 25 percent expected a contraction starting in 2021. That’s all within the six to 24 month timeline. As for stocks, yield-curve inversions are usually nothing to worry too much about, despite Friday’s stomach-churning 1.9 percent drop in the S&P 500 Index. That may explain why the equities market regained its footing Monday to finish little changed. The strategists at Richardson GMP point out that after the yield curve inverted in February of 2006, the S&P 500 proceeded to rally another 26 percent. That’s not an anomaly. Stock-market returns during periods of yield-curve inversion are between 15 percent and almost 60 percent, according to Medley Global Advisors. The firm said that’s likely driven by the expectation that an inversion signals future monetary policy easing. Indeed, the futures market is pricing in about a 73 percent chance that the Fed cuts rates by year-end, up from almost zero chance at the beginning of the month, according to data compiled by Bloomberg. Lower rates and bond yields should help support equities. Bloomberg News’s Lu Wang reports that Wells Fargo strategist Chris Harvey is considering a higher target for the S&P 500, a move that would shift the strategist’s forecast from one of the most bearish to one of the most bullish. Given current rates, a fair value for the S&P 500 is around 2,900, up from about 2,800 on Monday, according to Harvey. His current year-end target of 2,665 is the second-lowest among strategists tracked by Bloomberg. Credit Suisse’s Jonathan Golub boosted his year-end forecast by 100 points last week to 3,025, in part because of a less hawkish Fed. Emerging markets had a rough 2018, with the MSCI EM Index of equities falling 16.6 percent. But things started to turn around in late October, and the EM gauge has since climbed 11.94 percent, compared with a loss of 2.52 percent in the iShares MSCI Developed World exchange-traded fund. The bonds of developing-economy countries have similarly outperformed. 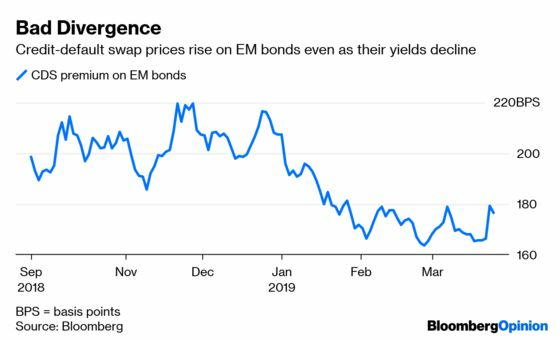 But there are some worrisome signs developing in the derivatives market that suggest it’s only going to get tougher for EM from here. The cost of hedging against losses in developing-nation debt over the next five years with credit-default swaps has jumped by the most since early August, Bloomberg News’s Srinivasan Sivabalan reports. 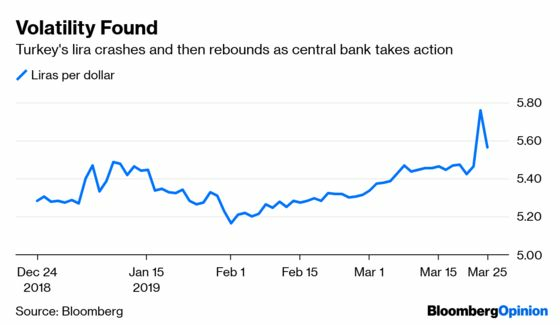 Also, the yield on the Bloomberg Barclays EM Hard Currency Aggregate Index of bonds and a measure of CDS prices on 14 sovereign issuers are breaking away from their normal tendency to move together. The 30-day correlation between these two indexes has fallen to the lowest level since September 2017, Sivabalan notes. Whatever the outcome, emerging-markets have a lot of cushion. Foreign-exchange reserves for the 12 largest emerging-market economies excluding China have jumped to $3.19 trillion from last year’s low of $3.12 trillion in late October. That continues a long-term trend, with currency reserves having jumped from less than $2 trillion in 2009, data compiled by Bloomberg show. Few parts of the commodities market these days can match the wild ride in hogs. 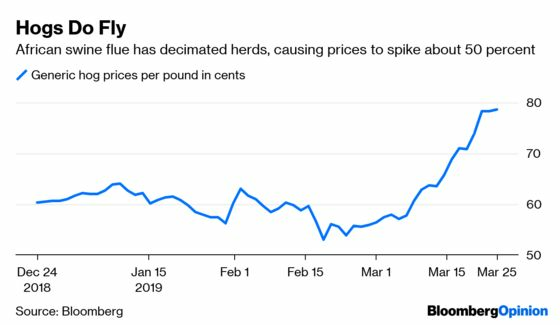 Pork prices have surged about 50 percent in the past five weeks alone, and volatility in prices is about the highest since 1986. The moves in the market can be tied to African swine fever, which is ravaging China’s hog herd, the world’s biggest, and creating a supply scare. China’s government said its sow breeding herd was down about 15 percent. That decline is bigger than the entire North American herd, according to Lydia Mulvany and Michael Hirtzer. They note that earlier this month, China made its third-biggest weekly purchase of pork from the U.S. ever, and on Thursday the pace of exports increased despite a massive tariff. The U.S. Department of Agriculture expects total Chinese pork imports to jump 28 percent. Money managers are noticing. Knowing that China generally has trouble reporting accurate figures, they figure that the authorities may be underestimating the hit to its herd. And so money managers have flipped back to being bullish from bearish on hogs, with long positions outnumbering short ones by 8,090, weekly U.S. Commodity Futures Trading Commission data on futures and options show. Holdings were net-short by 3,633 positions a week earlier. Amid all the hand-wringing about the health of the economy and whether the U.S. economy is about to fall into a recession, the housing market seems to be making a bit of a comeback. The National Association of Realtors said Friday that sales of previously owned U.S. homes rebounded in February to post the fastest pace in almost a year, topping estimates and snapping a three-month streak of declines. Contract closings increased 11.8 percent from January’s pace to a 5.51 million annual rate, exceeding all forecasts in a Bloomberg survey that had called for 5.1 million, according to Bloomberg News’s Carlyann Edwards. Markets will find out Tuesday whether that housing report was an outlier or more indicative of a broader trends. First, the government is forecast to say that housing starts for February dropped 1.4 percent, which wouldn’t be bad following the huge 18.6 percent gain in January. Then, the S&P CoreLogic Case-Shiller National Home Price index is projected to show a gain of 0.3 percent for January, snapping three straight monthly declines.